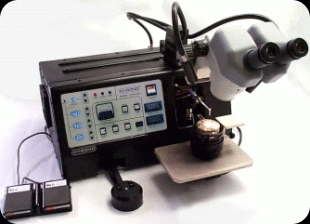 Model 616B-001 Digital Ultrasonic Peg Bonder is designed for ultrasonic bonding of interconnects in applications that do not require the bonder to feed wire. When fitted with a WP-280 and OP-75, the 616B-001 becomes a semiautomatic machine for medium to high volume production. 45 / 135 lbs (20,4 / 61,2 Kg). Shipping weight will vary.